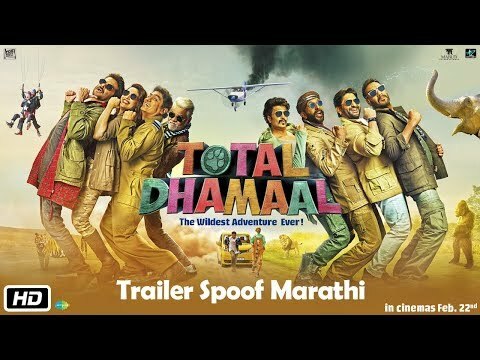 Total Dhamaal Back again with New Hilarious Spoof but this time its in Marathi, Ajay devgn starrer film Total Dhamaal Trailer Spoof got hugh response by our Marathi Audience and People loved the dubbing in Marathi. Cast of Film: Ajay Devgn, Anil kapoor, Maduri Dixit, Arshad Warsi, Riteish Deshmukh, Javed Jaffrey, Sanjay Mishra, Boman Irani, Johnny Lever, Aashish Chaudhary. Film Production: Fox Star Studios, Ajay Devgn FFilms, Pen India Limited, Maruti International.